I delayed this review for a week mainly to get the feel of the system, to know better and to know the best and worst of it . It’s not a design easily admired at first sight , or even at third or tenth. Seriously DELL has taken a back step in designing their top end XPS system. DELL XPS 1530 design is still the best I have seen from them . 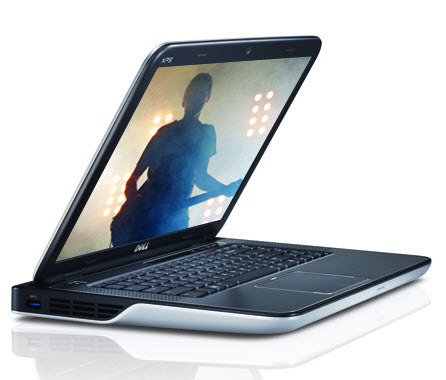 Even though few Studio design are good , IMO DELL old XPS design was the best. New XPS has rounded edges which spoil the look of the laptop and gives a Mac kind of look. The lid is pale ivory white coated . Old XPS had option to choose from , say blue , black , red color and it was for no extra cost . But to change the default LID to a fancy one , you need to spend extra 3500+ Rs , instead of spending it so much , you can go to decalgirl or any other online laptop skinning site and order a good , better looking skin for less than 1500 Rs. I even found skins for less than 400Rs. Anyway open the lid, you are greeted with a beautifully placed keyboard and a dark metallic grey palm rest over. The touchpad is pretty big and for me it’s a little “NO”. I use a external mouse and this big touchpad even though doesn’t come disturbing while typing, but still pushes the entire keyboard design close to the screen. Compare that to my old DELL XPS M1530, the keyboard in the newer XPS is at least 2-3 cm closer to the screen. It might be a hindrance factor if you try typing while lying down , the fingers might hinder the view of lower 1/3 of the screen. The latop is pretty bulky and heavy too , in my case its due to the 9 cell battery. But i think those who select a 6 cell will be slightly lighter. The vents for the GPU/CPU is placed on the left side of the laptop , compare it to the old XPS , which are behind the screen and sometimes a fully opened screen can partly block the vents , also there was big fan on the bottom , making the exhaust of hot air pretty complicated. But New XPS overcomes these problems in grand style. The vent is on the left side and there is only one 3.0 USB port , so unless you stick a big wireless device or receiver that sort on the left side ,the exhaust are pretty much open and big to push out chunk of hot air. Surrounding the keyboard is two vertical row of JBL speaker on either side of the keyboard. The woofer is placed beneath the laptop. There are three touch keys on the op along with the main power key. Power Key is elongated button and sometimes the press if on the outer edge of the button, doesn’t get recognized as press. It comes with 1 eSATA port, 1HDMI , 2 3.0 USB port and ports for headphones which can mimic for SPDIF output ( haven’t tried it yet) . Front has a Memory card reader. One thing I found is the USB (3.0) are very tight, could be due to unused port , but still slots are very hard to use. The display is placed in some kind of groove, so there is some restriction for full opening of the screen. Even though its not a big issue. I went for the Full HD 1920x1080P screen.I recommend others to get it too , mainly because the standard display doesn’t seem to perform well and reviews thus far have not been helpful After reading through reviews and comparison in many sites, it was agreed that this screen is by far the best one . and you won’t be let down too.. The color and brightness is simply outstanding. The clarity is top notch. Watching a 720p/1080p video is a pure delight. I had a WXGA+ 15.4” screen on my old XPS . the screen clarity was superb in that screen too , the brightness , color wise it was excellent .. but the resolution was 1444×900 , but this FULL HD screen is simply the best. For a week now I have kept the brightness around 70% , which I feel is still very bright at night. To be honest , I am now preferring to watch movies on this 15.6” screen rather than the pale LCD Samsung 40” TV . I was very skeptic about the speaker after reading various reviews. I was wondering whether they can produce much effect , but after installing everything and running a music video (HD) , I couldn’t believe what I was hearing . The bass was right , I mean , the bass was contended to a small space. Since most of the time the laptop is going to be near to a person , the bass is designed to produce the effect to such space. Bass effect is not much loud or too low , It was ample enough to make a distinct bass effect. The 2 speakers on the sides of keyboard aren’t low either, they have enough punch and crispiness to balance the bass effect. The over all effect is very good. Needless to say “ The Best in Laptop “Segment !! Keyboard is a chicklet designed one. The keys have enough space between them and response / feedback to the presses are also good. The SPACE and BACKSPACE have a loose key noise upon pressing , other keys are very quiet and very soft too. Bloggers , or heavy forum goers will be delighted to type on this keyboard. I preferred a Backlit one , and its simply gorgeous at night . Moving from a normal, below par keyboard to a chicklet based plus backlit keyboard is big jump for me. So IMO the score is actually 5.9 , least from RAM and HDD . A additional 4GB would push this 5.9 to somewhere around 6.9 or 7.2 or even more. And new SSD will push the score even more. Installed crisis 2 and settlers 7 thus far and ran former at 720P and later to maximum and both ran smoothly. I think this laptop can handle most games at 720 P and some games at native 1080P resolution. I am not a avid gamer , I already have a PS3 and still I have many games unfinished on it. But after playing a game on Laptop with a good graphics card is a delight . Any day Keyboard + Mouse rocks !! I played Crysis 1 in my M1530 last time and it ran the game at medium and now Crysis 2 at 720p . The Laptop runs pretty cool . Even after heavy gaming the temperature doesn’t run too hot. The good thing is the graphics card is asked to work only when there is a need for high end graphics , all other times the Intel Onboard graphics takes care. This is good , because the component is least used and ready when needed , this improves the longevity of the component, this is achieved through the OPTIMUS technology by Nvidia.that’s why the system is able to run cool most of the times. Even after heavy gaming for hours , the palmrest on the left side becomes little hot , but compare that to my hot pan XPS 1530 .., there all the graphics , from desktop to gaming is carried by 8600M GT card. It will become hot soon , so after using my old XPS , this new XPS is a grand welcome particularly incase of heat exhaustion ,lower temperature and effective use of the components. Overall this new XPS 15 series is worthy upgrade. Performance to cost is excellent. At Rs 65,000 Rs , you get very decent specs and excellent screen and audio. This laptop is best for mobile multimedia and even a great replacement for PC.. or for those who need mobility and PC like performance. Any queries , doubts , do leave it in the comment section below … Will try to post few benchmark results and few ingame video clips if possible. I think you can , you can ask dell itself to replace it for extra charge , or you can buy it from ebay , but you need to have good hands and pretty good eyes before replacing the KB. You can call your dell support . I wanted to know if you actually bought a skin for your laptop. If so, from where? Do you suggest i buy a skin? Or are the square edges very odd? There are few skins specifically for l502 , check twice before you buy and it shouldnt be a problem. but then again the skins which comes will leave atleast 0.5cm on all sides to fit correctly , so plan and get a skin which has a silver background and blends nicely .Do comment back if you get one and possibly post a picture or two..
Do you know any indian company that makes skins for the L502x? If so, please post their website address here if possible. Thanks a ton! There were few online sites with skins , try Gelaskin , it will cost a huge sum , as it is from abroad , but the choice and size would be near to perfect.